That's 12 sales so far this month as Wes Sanford at Northrop & Johnson confirms that he's sold the 32.3m motor yacht Starlight to a direct client. 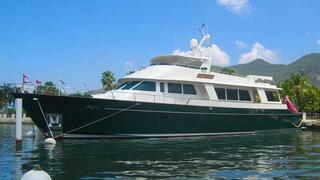 Custom built in 2003 by the Derecktor-Goetz team, she’s had the same owner and captain since new and they’ve maintained her, says Wes, in impeccable condition. Accommodation is for six guests in a master suite and two twin cabins while a pair of 1,800hp MTU engines give her a cruising speed of 22 knots and a range of 850 nautical miles.